I once knew a girl who wanted to brush her teeth after drinking and mistook a tube of Preparation H (hemorrhoid cream)for toothpaste. How to say this politely: I was once "engaged" in an "act" with an ol' gal on her couch and we needed something to "ease" the way, if you get my drift. I got a tube of lotion I had seen on her end table before we turned out the lights, and with one hand, unscrewed the cap and squeezed some out and "applied" it. Trouble was, it wasn't lotion, but her denture adhesive. Something's bogus here--the picture and/or the story behind it. 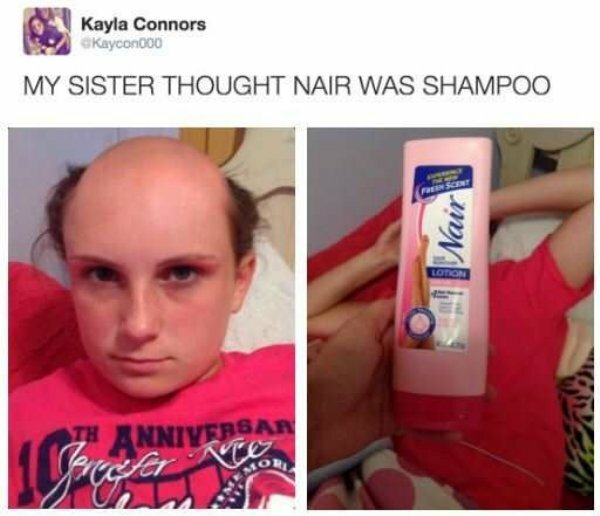 Nair has to be left on much longer than it would take to shampoo your hair, and even then it doesn't work that efficiently. There's no way it would remove every hair on someone's head (It can't even do that for your legs), and there's no way it would leave a perfectly even fringe around the sides.